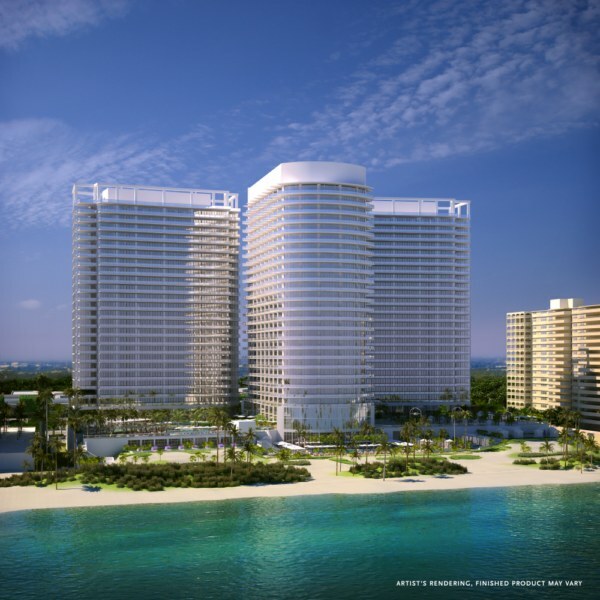 (Bal Harbour, Fla.) The St. Regis Bal Harbour Resort, one of the most ambitious mixed-use resort development projects in the Southeast, continues to progress on its construction timeline here in the highly affluent South Florida village. Situated on an expansive oceanfront stretch that once housed a Sheraton hotel, the St. Regis Bal Harbour Resort is a five-star resort hotel and condominium aimed at delivering one of the most luxurious and graceful lifestyles in South Florida. According to a resort spokesperson, Starwood’s biggest-ever development is scheduled to top off the third and final tower in February, with construction expected to be completed in late 2011. Composed of three 27-story all-glass towers, the 9-acre resort aspect should be open sometime in 2012. The current design plans call for 268 ultra-luxurious residences, 37 condo-hotel suites, 183 hotel rooms and 24 fractional suites. Highlights include signature butler service, a 12,000-square-foot Remède® Spa and serene gardens with multiple pools, water features and sculptures. Each tower will have its own private lobby entrances, security, valet, and covered parking, as well as access to a variety of St. Regis Hotel services. The signature St. Regis Butlers will offer white-glove service, from 24-hour in-room dining to pet pampering, while the 12,000 square-foot RemèdeSM Spa will provide the ultimate spa experience and state-of-the-art fitness center. Everyday indulgences will also include fine dining restaurants, childcare, and poolside cabana and beach services. Special imaginative elements will be the serene gardens and sculptures with decorative fountains and pool features, as well as a premier selection of works by world-renowned artists. One of the most distinguished neighborhoods in South Florida, Bal Harbour Village sits at the northern tip of Miami Beach. An oasis of affluence and indulgence, Bal Harbour is a favorite destination for many jet-setting visitors and seasonal residents. The property is situated directly across from the fashionable Bal Harbour Shops, one of the world’s most renowned shopping venues. St. Regis real estate prices will start at $1.9 million for the 268 residential units that range in size from 1,777 to 6,868 square feet. The 36 condo-hotel suites, sized from 1,310 to 1,475 square feet, also start from $1.9 million. (New York, New York) – Donald Trump did some Christmas shopping on the golf course, walking away with two new courses to his growing golf empire. Both of the courses Trump purchased were previously owned by Empire Golf, a well-known developer and operator of upscale courses in the Mid-Atlantic region. Trump’s first acquisition was 365-acre Pine Hill Golf Course in south New Jersey, a semi-private golf course with views of the Philadelphia skyline. According Dan Scavino, executive vice president and general manager of the Trump Organization’s Trump Golf division, Trump plans on converting Pine Hill to a new ultra-luxury private club called Trump National Golf Club-Philadelphia. The second golf course, 400-acre Branton Woods Golf Club in Hopewell Junction, N.Y., will be renamed Trump National Golf Club – Hudson Valley, New York. Branton Woods is located in the lush Hudson Valley and features spectacular views of the Stormville Mountains. The 18-hole championship golf course, complemented by an Adirondack-style clubhouse, will also be operated as a new high-end luxury private club. Pine Hill, designed by world-renowned golf course architect, Tom Fazio, is an award-winning course on southern New Jersey’s highest point. It is located near the highly exclusive Pine Valley Golf Club perennially ranked as one of the top courses in the country. Branton Woods and Pine Hill cost approximately $45 million each to build, according to the Trump Organization, and took years of permitting approval to get built. The purchase prices for all three developments were not released.